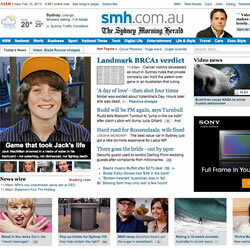 The story about Jack’s death was the most read on the Mercury’s website this year, with more than 40,000 people viewing it since it was posted on February 15. Strong, capable swimmers can fall victim to Shallow Water Blackouts. Channel Ten ran a story on the importance of remembering the dangers of Shallow Water Blackout this summer. We recently came across a blog post on the Australian Lifeguard Network blog that aims to educate lifeguards about Shallow Water Blackout. The following article is courtesy of Australia’s Federal Minister of Sport, to whom we are grateful for her support of our campaign. Reprinted with permission. As Sports Minister you meet with many people and hear many inspiring stories. But occasionally you meet with someone whose story completely changes your outlook. Whilst in Wollongong in February, I met Sharon and Gary Washbourne. Sharon had emailed me previously with a tragic story of the drowning of her 12 year old nephew, Jack Alexander Kevin MacMillan. Jack loved being in his pool, of which they moved to their new home only 7 months prior in July of 2012, he was so excited for Summer and warmer days to arrive so he could swim everyday, as any young boy of his age wants to do, and this he did each day until 2 days before returning to school. Jack was meant to start his 1st day of High School at ICS (Illawarra Christian School) on 31st January, he couldn’t wait to go back to school and catch up with his mates, and play sport each lunch time with them all. The email then goes onto to detail every parent’s worst nightmare. On Tuesday, 29th January at 1.15pm, a time and date we will never forget, Jack (12) his sister Ella-Lin (8), Stepsister Charlotte (8) and a neighbouring friend of the girls also 8, had all finished up playing in the pool. My sister, Jack’s mother, Michelle, stepped away from the side of pool with her 6 month old daughter, Liliana to open the door for the girls to go in to change. Jack remained out by the pool to remove all the blow up toys, of which he was such a great help in doing. He said to his mother, “just a few more laps”, being a strong swimmer, and a fit young kid, Michelle literally turned her back for 1-2 minutes at most. In this time, Jack swam his laps, of which some were, under water. His mother then promptly returned to tell him to hop out, when she noticed him sitting in a curled squatting position on the bottom of the shallow end of their backyard pool. Terrified as to what she witnessed in such a short period, she passed baby Lili to Ella and jumped in to drag Jack out of their pool to commence CPR. Something she will never get over and plays over and over in her mind. Jack, like all active, determined 12 year old boys, was competing against himself in the water holding his breath and blacked out. Due to these activities, his urgent need to breathe response, was not triggered and tragically, Jack drowned as a result of Shallow Water Blackout. Sharon and Gary have started a campaign, http://shallowwaterblackout.org, to educate the public about the dangers of holding your breath under water for too long. As a Government we commit more than eight million dollars to water safety programs every year. But there are new opportunities where we can do more. As Minister, I have already opened discussions with key water safety experts including Laurie Lawrence and the Royal Life Saving Society to talk about how together we can raise awareness of Shallow Water Blackout (SWB). Backyard drowning is completely preventable. Water safety advocates, like Sharon and Gary, have led the charge to help parents understand the risks and how to prevent drowning for decades. Sharon and her family’s story is heart breaking. But, Sharon & Gary have chosen to make a difference and do all they can to raise awareness of Shallow Water Blackouts. I commend Sharon and Gary on their efforts, and encourage anyone with young children to get online and visit their website to learn about Shallow Water Blackout and get your friends and families to do the same. Swimming and having fun in the water is part of summer in Australia for many of us. Besides being a great way to cool down on a hot day, swimming is an excellent all-over body workout for people of any age; it tones and strengthens muscles, builds endurance and cardiovascular fitness, improves flexibility, helps us to maintain a healthy weight and reduces mental stress. Teaching our children to swim is a high priority life skill for most parents and I well remember the sense of relief when all three of my boys achieved a competent level in the water. 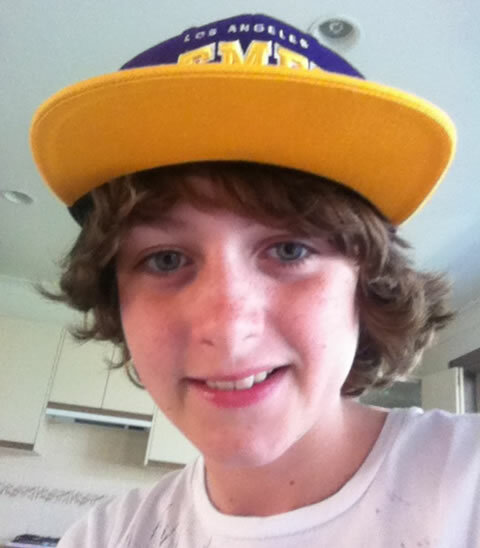 Last month on the 29th January in Wollongong, twelve year old Jack MacMillan drowned in a metre of water in his family’s backyard pool. Jack was a very capable swimmer who loved being in the pool; at the time he was swimming under the supervision of his mother. What could possibly have gone so wrong? Jack had been enjoying a game most of us have participated in either as children or adults; seeing how many laps he could do while holding his breath and swimming underwater. 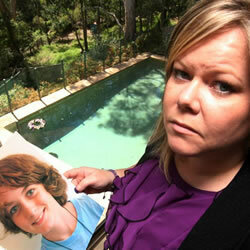 His mum noticed he had stopped swimming and was lying motionless on the bottom of the pool. Initially thinking he was just mucking around, she quickly realised the situation was much more serious but by then it was too late. Jack MacMillan died from shallow water hypoxia also known as shallow water blackout (SWB). Shallow water blackout occurs when the swimmer loses consciousness due to a severe lack of oxygen to the brain. Under normal circumstances our natural inclination to breathe is caused not from a lack of oxygen but from an increase in the levels of carbon dioxide in our bloodstream. Prolonged or repetitive breath-holding or hyperventilating decreases the amount of carbon dioxide circulating through the bloodstream, slowing down the body’s natural urge to breathe. With a decreased desire to breathe, the underwater swimmer mistakenly believes they are able to hold their breath longer than they safely can. Starved of oxygen, the swimmer loses consciousness without warning and drifts towards the bottom of the pool. With the loss of consciousness the body reacts automatically and recommences breathing, filling the lungs with water. Quietly, without fuss or drawing attention to themselves, the swimmer very quickly drowns. Prior to hearing the news story on the MacMillan family’s tragic loss of their son Jack, I had never heard of shallow water blackout. While today may be the official end to summer, locally our warm climate can see us enjoying our swimming well into April. Take the time to talk about shallow water blackout with your family and friends and raise the awareness of the danger of prolonged or repetitive breath-holding in water. One lap down the pool holding your breath might not do you any harm but ongoing laps holding your breath underwater increases your chances of suffering from a potentially fatal shallow water blackout. Gary Washbourne speaks on Drive with Gary Hardgrave. February 28, 2013.